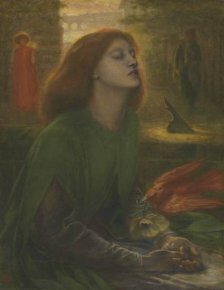 Along with major shows, often based on prestigious loans from internationally acclaimed establishments intended for sell-out crowds drawn by extensive advertising campaigns, the Tate Gallery presents “in-house” exhibitions with little media fanfare on a regular basis, a chance to take certain works out of its vast storage selection. This does not mean they are any less interesting : we should recall for instance those highlighting Blake or Gillray. The introductory wall text which welcomes visitors in the large gallery housing all of the paintings includes of course a reference to the founding text, in English, on the theme, the famous A Philosophical Enquiry into the Origin of our Ideas of the Sublime and Beautiful by Burke (1757), although there were a few precursors  as well as successors , familiar only to specialists today. The difficulty lies obviously in the definition of sublime, notably what it includes – the risk being it turns into a “catch-all” of the spectacular and the maudlin alike, both equally difficult to define and varying through different periods. The task facing Christine Riding, curator for this exhibition, was therefore presumably, not an easy one. Two monumental works immediately draw the eye when entering the gallery. Over 300 x 400 cm in size, high up the wall and hanging across from each other in the middle of the gallery : Gordale Pass (ill. 1) by Ward  and The Deluge (ill. 2) by Danby were placed here for effect. In a way, they represent two emblematic examples of “subjects” recurring in the exhibition : nature’s excess, that which physically reduces man to a microscopic scale, and the incommensurate gap between God’s power and the frailty of the mortals He created. The Tate commentary (the texts bear only the author’s initials) presented for Gordale Pass uses the expression, “awe-inspiring” which blends the idea of fear, veneration and self-awareness of one’s minuteness. 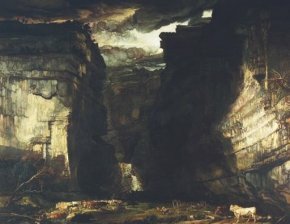 The grandiosity of the scene at Gordale makes us bow our heads before the vastness of divine beauty and brings us closer to our Creator – while the horror of the Biblical episode reminds us that divine kindness also has another aspect – impenetrable and incomprehensible to man – embodied in Yahveh’s cruelty in the Old Testament. All of this might be considered rather ordinary – although the technical quality of both the paintings make them extremely attractive to viewers – but in both cases there is the unmistakable presence of a “sub-text” which is very well explained on the side. Gordale Pass contains a political and patriotic dimension : it is meant to bolster the sentiment of the enduring character of English soil in times troubled by the Napoleonic Wars and although the very visible reference to John Bull in the presence of a bull in the foreground draws smiles today, we can well imagine that it was understood literally by less “sophisticated” contemporaries at the time. From the idea of “sublime” defined as something close to the gods, we drift here to the “subliminal”. 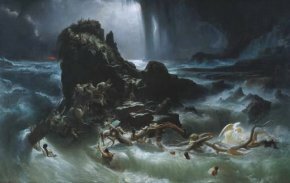 In the case of The Deluge, we are looking at a rather less noble aspect of the sublime : a reminder that it sells well in its most spectacular version, and that Danby became rich by sending it on itinerant exhibitions among an enthusiastic public ready to pay for a look. In the same vein, the wall at the back offers two less monumental works, if we may say so (200 x 300 cm), a triptych by John Martin (1789-1854) evoking the Last Judgement as described by St John in the Apocalypse : The Great Day of His Wrath (“Dies irae”, 1851-3) and The Plains of Heaven : the card tells us that these present two elements characteristic of the sublime, the apocalyptic vision and the majestic landscape. 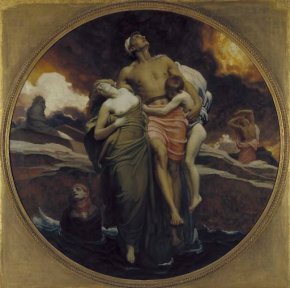 Strangely enough, given the analogy in subject, the organizers chose to place the famous painting of the resurrection of the dead by Leighton, And the Sea Gave Up the Dead Which Were in It (ill. 3) (Apocalypse 20:13) on another wall, and not here. In fact the last painting presented on this wall is a large, and very long canvas, (100 x 300 cm) : Chaos (around 1875-82) by George Frederic Watts. This is not a reference to the end of the world, but, on the contrary, to its origin as perceived by Greek and Roman pagans, the sublime here consisting in the depiction of the extreme confusion which reigned over the cosmos before the beginning of Time. 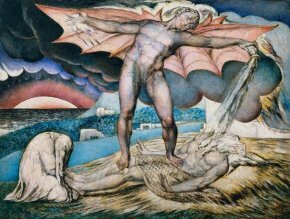 In all of these works, Satan of course plays at least as important a role as God Himself, and we see this “namely” at least twice, in two well-known paintings which we never tire of admiring : Satan Smiting Job with Sore Boils (ill. 4) by Blake, illustrating the persistence of absolute evil despite God’s goodness, and the unfinished Satan, Sin and Death by Hogarth , a subject which Burke designates as the very essence of the sublime. 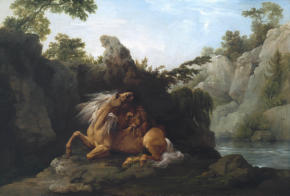 _ The extreme cruelty of the animal kingdom (here again incomprehensibly intentional on the part of the Almighty) is also illustrated in two paintings which were much appreciated at the time : Deer and Deer Hounds in a Mountain Torrent by Landseer, where the dogs are man’s accomplices in fighting other animals, and a Horse Devoured by a Lion (ill. 5), a scene taken from the antique by the famous horse “specialist”, Stubbs. One of the guiding themes in the exhibition, generally providing its cohesiveness, is quite obviously its black character : black in the figurative sense of satanic allusions and in the apocalyptic scenes shown, but particularly the blackness of the paintings themselves in the physical sense, making one of the show’s attractions the chance to view images which are practically impossible to reproduce even in the highest quality artbooks , where small details (often poor creatures dying amidst natural disasters) included by the artist in the vast stretches of near-black canvas, become almost invisible. This aspect of the sublime in painting is best illustrated in The Deluge by More, where “one sees nothing” except for a few human shadows barely recognizable against an almost uniformly dark backdrop, with only a dim and very vague glimmer in the distance. 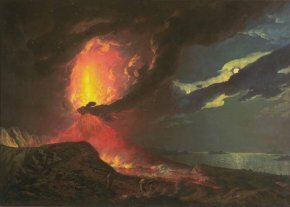 Although not everything in the sublime is black, on a chromatic level, as shown by the Tate, the succession of avalanches (Avalanche in the Alps) , shipwrecks (ill. 6), fires (The Battle of the Nile), volcanic eruptions (ill. 7), battles (The Battle of Camperdown) and ensuing events (Zonnebeke)  do a very good job of recreating Burke’s attempts to grasp the elements of the sublime by associating it with anything which evokes a catastrophe in the etymological sense, the absolute upheaval of existing conditions. To this we can add the more or less direct or veiled references to the “darkness” of the soul, whether it be the imminence (Fishermen at Sea) or the reminiscence (The North-West Passage) of danger, the awareness of human mortality (The Vale of Rest). 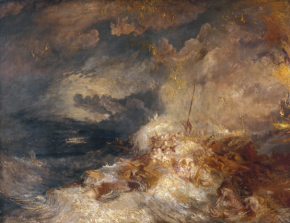 The mural text explains that Ruskin considered this work “repulsive and ignoble”, a resigned wait for death (The Last Voyage of Henry Hudson by Collier) or simply the moment of death itself, an apotheosis in the sense of “sublime fulfillment” as stated in the dictionary definition (ill. 8). Fortunately, we might say, some paintings retain a bit of mystery as to their notion of “sublime”. A first example is Richard Dadd’s interpretation of The Flight out of Egypt with its loud colours, painted in fact at a time when he was admittedly drifting toward dementia, but better yet is the enigmatic androgynous figure of G. F. Watts’ The All-Pervading  which allows us free rein in imagining its possible identity. Whether or not one appreciates this 19th century “British” painting, the exhibition is clearly successful in raising the question of changes in taste. Among the many treasures at the British Library (on display in a permanent exhibition), there is a spectacular engraving by Thomas Smith of Darby dated 1743 – about ten years before the publication of Burke’s A Philosophical Enquiry – A Prospect in Dove-Dale 3 Miles North of Ashbourn. The library sign explains that this is a “Romantic view of landscapes previously considered devoid of interest”. We might wish to transpose this concept here and say that this synoptic hang whose sole common denominator is the sublime as announced by the organizers provides the chance to retrieve certain forgotten paintings “previously considered devoid of interest” . Visitor information : London, Tate Britain, Millbank. London SW1P 4RG. Tel : +44 (0)20 7887 8888. Open every day (except 24-25-26 December) from 10 am to 6 pm. Free entrance. Alas, the exhibition does not have a catalogue. The English translation seems to have appeared later, but long before Burke’s work. An Essay upon Sublime : Translated from the Greek of Dionysius Longinus Cassius, the Rhetorician. Compar’d with the French of the Sieur Despreaux Boileau. Oxford : printed by L.L. for T. Leigh, at the Peacock against St. Dunstan’s Church in Fleetstreet, London, 1698. Notably Two letters to the Right Honourable Lord Byron, in answer to his Lordship’s letter …on the Rev. Wm. L. Bowles’s Stricture on the life and writings of Pope More particularly on the question, whether poetry be more immediately indebted to what is sublime or beautiful in the works of art, or the works of art ? By the Reverend W. L. Bowles. London : John Murray, 1821. Complete title : “Satan, Sin and Death : Scene from Paradise Lost by Milton”, 1735-40. See our discussion of this painting. See our discussion on Hogarth’s paintings, the problems in reproducing areas of dark solid colours. See articlehere concerning the role of the Alsatian Loutherbourg in the “discovery” of mountain scenes for the educated British public. See articlehere for Orpen’s antimilitary attitude in his paintings of WWI. We mention in passing the presence of Hope (also by Watts) in the exhibition. Rumor has it that this is Barack Obama’s favorite painting. This will no doubt help to make it popular again, at least in the United States. See the article by Valérie Duponchelle in Le Figaro (20 January 2009).